US Air Force photo by Staff Sgt. Brian Ferguson, via Wikimedia. The Obama Administration’s drone strike programs are enormously problematic: it’s unclear if the immediate benefits gained from killing al-Qaeda leaders are worth the long-term costs of very publicly eroding Pakistani and Yemeni sovereignty, and whether frequent drone strikes create more militants than kill. “The unintended consequences of our actions are going to outweigh the intended consequences,” former CIA Station Chief Robert Grenier recently said, arguing that Obama administration’s enthusiasm for discriminant strikes is counterproductive. But complaining that the use of drones over manned aircraft isn’t “brave” is just silly — the point of war isn’t to demonstrate macho bravado by risking soldiers’ lives, it’s to force the enemy into submission. Complaints about “bravery” are a juvenile criticism of drone warfare. Greenwald’ second point — that the low-cost nature of drone warfare encourages aggression — is more on point. “The rapid proliferation of drones, beyond their own ethical and legal quandaries, makes violence and aggression so much easier (and cheaper) to perpetrate and therefore so much more likely,” Greenwald notes. UCAVs’ lack of physical risk for those doing the killing is a feature, not a bug, at least to those on those on the trigger end. But while the operational capabilities of UCAVs differ from their manned counterparts by degrees, their risk avoidance is an absolute — no drone pilot will ever be killed by a SAM. Greenwald’s right to worry that increased use of unmanned aircraft will lower policymakers’ threshold for initiating armed conflict. Arguing that more lethal military technologies increase the incidence of aggressive wars by lowering their expected costs aren’t new, and make sense. In operational terms, UCAVs are not distinct from manned aircraft, and require the same extensive local support networks. However, while other military advances — guided missiles, body armor — lower risks to individual soldiers on a continuum, in a strict sense unmanned drone warfare negates it entirely, at least from the perspective of policymakers looking to placate domestic audience. This is an important point. American policymakers’ choice to utilize drones in Pakistan and Yemen is driven by the desire to minimize risk. It’s difficult to make firm arguments about how US military policy would differ if drones were not available. Presumably airstrikes, restricted to manned aircraft, would be a higher risk strategy than it is today, making politicians less likely to utilize them. It is unlikely that the United States would wage an strike campaign in Pakistan anywhere near as comprehensive as it does if unmanned aircraft were not available. However, drones aren’t a perfect substitue for manned aircraft, and the decision to use drones is costlier than Greenwald recognizes. Greenwald underestimates the difficulties and local infrastructure requirements of drone warfare, and overestimates the military capabilities of UCAVs. 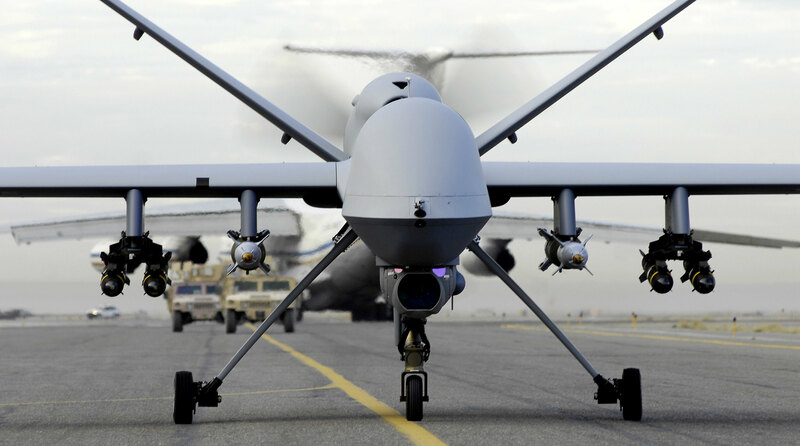 Drones like the widely-used MQ-9 Reaper are smaller and slower than fighter jets, giving military planners reason to utilize manned aircraft over UCAV in low-risk theaters. The US Air Force flies manned F-15Es in Yemen, despite the low-profile of American military action there. Drone warfare is cheaper and less risky than manned airstrikes, but the difference is marginal — American policymakers do not make the decision to deploy UCAVs lightly, and there is no firm line between drone and other forms of warfare. These costs mean that when policymakers make the decision to engage in drone warfare they have already passed a relatively high commitment threshold, challenging the notion that “the temptation to use it regularly is virtually irresistible.” While the absence of drones would marginally raise the commitment level required to prompt agressive US military action, the change would be nowhere near as dramatic as critics of drone warfare imagine.